8 Best Coffee Subscription Boxes: Hassle-Free, Fresh & Artisan! You just won a free trip to Italy to sample some of the finest coffees in the world. No, not really. But if you had, you’d be pretty happy, right? Let’s be honest: even if you’d only won a shiny nickel, an unexpected surprise causes your heart to beat a little faster. This is why subscription boxes are all the rage. We relish the anticipation of a package at the front door, regardless of what’s inside. As of 2016, subscription box services skyrocketed by 3,000% since just three years prior. Subscription boxes are gifts that keep on giving, and in today’s fast-paced world, where our daily activities are all but fueled by caffeine, the best of the best coffee subscription boxes are of particular interest. The idea behind this novel and progressive innovation is to remove the tedium of traveling to the store (or even devoting time online) to buy items that you regularly use. This ranges from prepared foods to clothes, TV shows to razors, and the list goes on. Let the USPS deliver fresh coffee to you hassle-free! Image via USPS. Why put the time in to get creative with your home-brewed coffee selections when there’s a million other items you could be checking off the daily list? Let an expert do it for you. What’s more, coffee subscription services make creative and thoughtful gifts for friends and family (and most definitely your jaded and glassy-eyed coworkers in accounting). From here, we’ll whittle a finely-tuned list of the 8 best coffee subscription service options available, along with any pertinent information to assist in your decision. The historic one that’s serious about freshness. Equipped with a notable story regarding its origins (tied to the opening of the first coffee shop in Vienna, Austria in 1683), Blue Bottle Coffee has exacting standards of delivering coffee at peak freshness. Using a coffee quiz (or just trust the experts), begin by selecting a blend, espresso or single origin coffee, along with your preference of ground or whole beans. The selection you make is then roasted to order and shipped within 48 hours, which is a unique industry trait. A Voyager Pack is available as a tour of Blue Bottle’s favorite coffees, with each package containing a 5-pack of single-serve coffee selections. This option arrives perfectly ground for convenience. Note: You can also sign up for a free trial and test a subscription before you buy. Blue Bottle Coffee offers a wide array of excellent coffee, diverse options, and one of the highest industry standards on freshness; our reigning champion as one of the best coffee subscription selections. The one with 500+ coffee selections to choose from. Mistobox matches you with a coffee curator who, based on your preferences, pairs you with the perfect bag of coffee to fit your palate and budget. As mentioned above, Mistobox offers over 500 coffees to choose from, empowering patrons to get the full experience with coffee types and flavors. Mistobox roasts your beans before sending to ensure maximum freshness; just choose whether you’d prefer single origin, espresso, blends or an expert pick of the beans. Also choose between either “Deluxe” or “Exclusive” (best of the best) selections. One 12-ounce bag of coffee. Also, you can gift someone with either 1-, 3-, 6- or 12-month subscriptions. Shipping is $5.00 per order. Use promo code “XJDA” for $10 off for a subscription plan. MistoBox is a great choice that certainly will never get old, given that there are so many coffee selections at their disposal. Driftaway Coffee counts the idea of creation at the heart of their venture. Nothing here is done for money, but for the love of creating a product that’s reflective of passion for coffee. They even created the packaging that holds the beans they personally roasted for you. From there, refine future selections based on your taste preference. This company places a large focus on the livelihoods of coffee growers; for every pound of coffee roasted, 5 cents is donated to World Coffee Research. The initial tasting kit features four 2-ounce sampler bags with single-origin whole coffee beans. Select a Doppio (11 oz bag) or 1 pound (16 oz) bag, along with the “coffee story” of your particular choice. You can elect to pay per shipment or for a 6-month period, which ultimately saves you $16. Driftaway Coffee is a feel-good service that also offers an outstanding initial tasting sample to refine future orders. The one that features a coffee playlist. At Crema.co, your evolving tastes over time are constantly surveyed, which means that highly personalized recommendations soon follow the initial questionnaire’s revelations. This is called your “coffee playlist”, and it changes on the same timeline that you do. It’s a progressive coffee subscription experience. The initial questionnaire wants to know the roast level (light, medium, dark, or decaf) you typically enjoy, along with your preference of fruity, sweet, chocolaty, or nutty. Every coffee from Crema.co is either single-origin or from just one country because they work with roasters who work directly with coffee farmers (Direct Trade). You’re in control, and therefore your experience is personalized to your specific taste. A 12 oz bag of coffee that you’ve chosen based on preference. You can change the frequency at any time. At Crema.co, coffees range from $15-$19. Each roaster sets the price per coffee, so the numbers vary a bit. Shipping is free in the continental United States. Note: you can start with a free trial to test the waters. Crema.co is representative of innovative and progressive thinking within the arena of best coffee subscription services. It should make for a fun and interesting experience for coffee aficionados. The one with the app. Angels’ Cup aims to help subscribers develop a superhuman sense of taste by exposing you to all the hues, tints, tones, and shades of coffee. A unique offering with this coffee subscription service is the Angels’ Cup app that rounds out your experience. Angels’ Cup allows patrons to try up to 208 different coffees during the course of the year. Simply sample the coffee and decide for yourself what you like; a number on the bag will help you identify the coffee afterwards. Use the app to record tasting notes and compare with the roast-master to up your coffee IQ to new levels. Choose between light and medium roasts, along with whole, coarse, or fine-ground beans. Use coupon code “CoffeeHunter14526″ for 25% off your first delivery. Angels’ Cup offers numerous coffee selections, along with an app to connect with the community and greatly scale your knowledge of all things coffee. The one that focuses on heralded Seattle roasters. At Bean Box, Seattle’s independent coffee roasters take center stage, as they are internationally recognized for selecting the highest quality beans from micro-lot farms and roasting them by hand. For a unique, regional experience, this company offers a great look (and taste) at the treasured artisans of the Pacific Northwest. Choose from either a Sampler pack (four 1.8 oz bags of coffee) or a Coffee of the Month (one 12 oz bag) as your delivered product. You control the frequency, depending on your intake. The Bean Box Sampler arrives with four 1.8 oz bags of coffee, along with tasting notes and roasting profiles. The Coffee of the Month Club features 12 oz of freshly-roasted whole bean coffee, tasting notes, brewing tips, and an artisan chocolate. Both plans ship with whole beans, to be ground yourself, and also feature automatic renewal on subscriptions. Shipping is free. Use coupon code “FRESH50” for 50% off of your first month of a subscription service. With two different programs to experience, Bean Box offers a good deal of variety and customization. Atlas Coffee Club aims, within each box, to give subscribers a story about their coffee. With this subscription, you can sample a new country each month, and taste the regional differences of each cup with help from the staff via tasting notes. Atlas curates high quality, single-origin beans (ground if you prefer), and each each batch is roasted specifically to highlight the tasting profiles distinctive to their native growing region. This company also offers a freshness guarantee, and a replacement bag is provided if the bag you receive is compromised. Choose between Half Bag (6 oz) , Single Bag (12 oz), or a Double Bag (24 oz) order, along with preference on ground or whole beans, along with a choice of Light to Medium or Medium to Dark roasts. You’ll also receive a postcard from a new country each month and tasting notes and brewing tips on your particular order. Deliveries are available every 2 or 4 weeks. Use promo code “Newbury” for $10 off subscription plans! 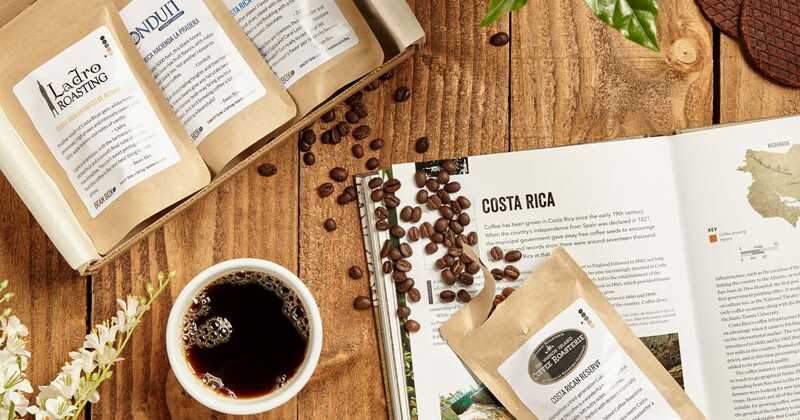 A solid addition to this list of best coffee subscription services, and especially so for those who enjoy experiencing worldly tastes while learning a little something about the coffee they’re enjoying. The unique one based in North Carolina. Based in heavenly Asheville, NC, this group of coffee-loving connoisseurs discover and share with the world what the finest local artisans have to offer. A regional, but very different experience from competitors. A true surprise each month, Coffee Crate features three different North Carolina roasters, and is filled with goodies to savor and enjoy. Each crate features three 4 oz bags of whole bean, North Carolina-roasted coffee, along with a treat from a local business, some awesome North Carolina vinyl swag, and a detailed description of each roast. Coffee Crate boxes ship on the 15th of every month and the coffee arrives between the 17th-20th of each month. Shipping is free in continental United States and $7.99 to Alaska and Hawaii. Use coupon code “HELLOCOFFEECRATE5” for $5 off subscription services. Coffee Crate offers a personal touch from the region surrounding Asheville, NC, and is a unique, fun offering among its competitors. While it’s true that ranking the best coffee subscriptions ultimately boils down to personal taste and preference, this list should give curious coffee drinkers a good idea of what to expect from the offerings of each company. At the end of the day, Blue Bottle Coffee‘s high standards and very apparent passion toward coffee rank them high on our list. Mistobox‘s gigantic coffee repertoire, Driftaway‘s initial tasting experience, and Angels’ Cup‘s app experience are unique and wonderful reasons to check them out. If our ideas on the best coffee subscription service differs from yours, we’d love to hear why in the comments below! I’ve seen subscription boxes for many things but I hadn’t even thought about them for coffee. That seems like an incredibly fun way to try new types and styles – including ones that you wouldn’t normally consider purchasing. Would you consider adding Send Me Some Joe (https://www.sendmesomejoe.com) to this list? I love the idea of a subscription box as a gift for coffee lovers too. Will be adding it to my christmas list for sure!